Highly recommended for anyone who wants a different-looking P-40 model, or is interesting in modeling Turkish aircraft. Regular visitors to Hyperscale will be familiar with Ayhan Toplu’s excellent models, often of Turkish-operated aircraft. 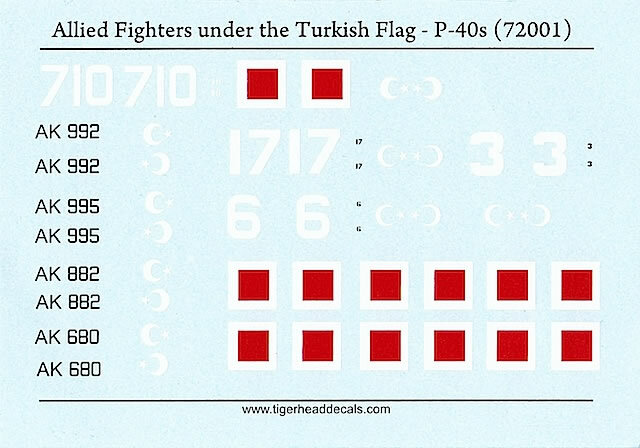 Ayhan has now taken this interest a step further by releasing a range of 1/72 and 1/48 decals for mainly (but not exclusively) Turkish subjects, marketed under the label of TigerHead Decals. Minor criticisms aside, both 1/72 and 1/48 sheets provide markings for the following eight P-40s, all of which were based at Gaziemir in Izmir Province, Turkey. P-40E, ‘White 710’, 6th Regiment, 2nd Battalion. The instructions suggest this aircraft was camouflaged in RAF Dark Green and Dark Earth over Neutral Grey. P-40E, AK 992/AK 995/AK 882/AK 680, all of 6th Regiment, 2nd Battalion. All of these aircraft are indicated as being finished in Dark Earth and Middle Stone over Azure Blue. P-40B, ‘White 17’, 3rd Regiment, XIVth Battalion. 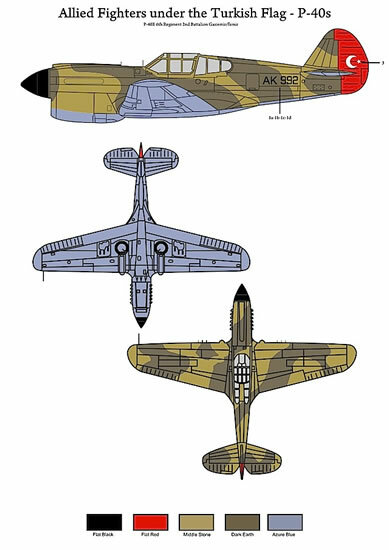 TigerHead points out that this aircraft may have been finished in either Dark Green and Dark Earth over Sky Blue, or Dark Earth and Middle Stone over Azure Blue, and supplies painting guides for both possibilities. P-40B, ‘White 6’, 3rd Regiment, XIVth Battalion. 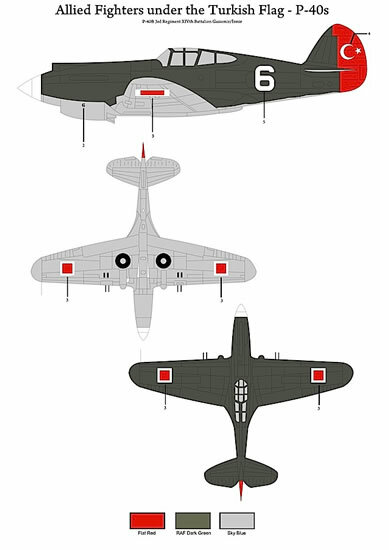 This and the following aircraft were camouflaged in overall Dark Green over Sky Blue. 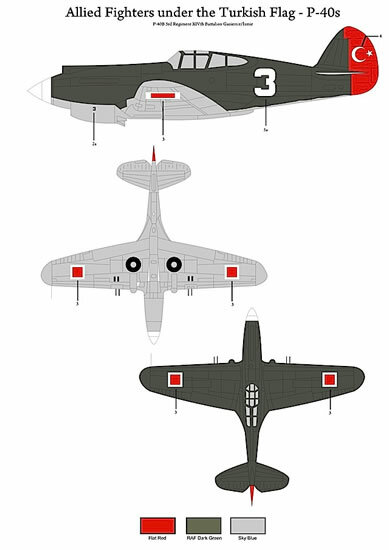 P-40B, ‘White 3’, 3rd Regiment, XIVth Battalion. To reduce costs, a painting and marking guide is not supplied with the decals, but is available for download from the TigerHead web site. 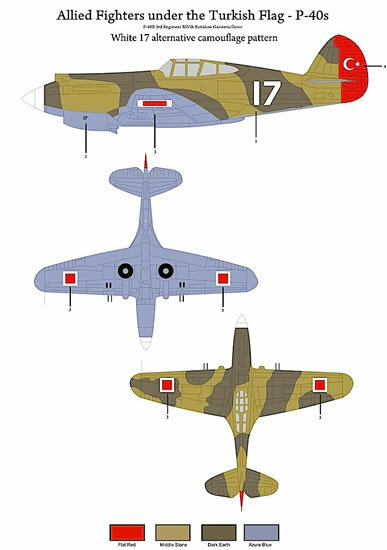 The guide is in full colour and provides port profile, upper and lower views of each aircraft – except for AK 992, AK 995, AK 882 and AK 680, which were presumably identically camouflaged and are therefore covered in a common set of illustrations. Paint colours and decal placement locations are clearly identified. The decals look to be of good quality. There aren’t many colours – only red, white and black – but printing is crisp with no obvious flaws, and the registration between the white and red of the national insignia appears spot-on. The only difference between the 1/72 and 1/48 sheets is that the former contains an additional four national insignia. No stencils are provided. 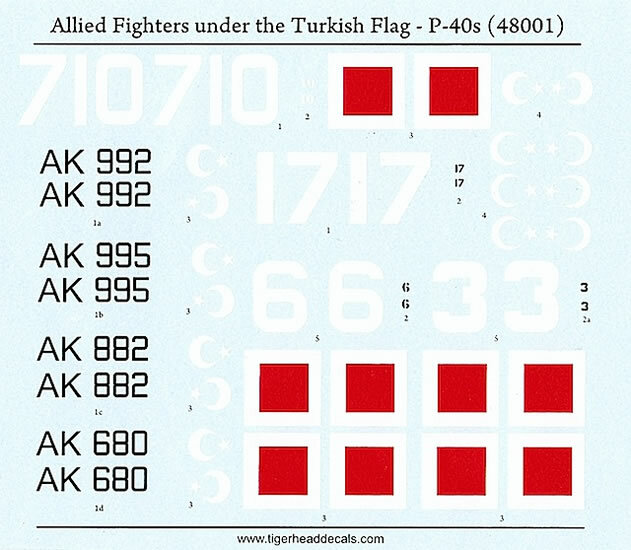 These decal sets are highly recommended for anyone who wants a different-looking 1/72 or 1/48 P-40, or is interested in modeling Turkish aircraft. 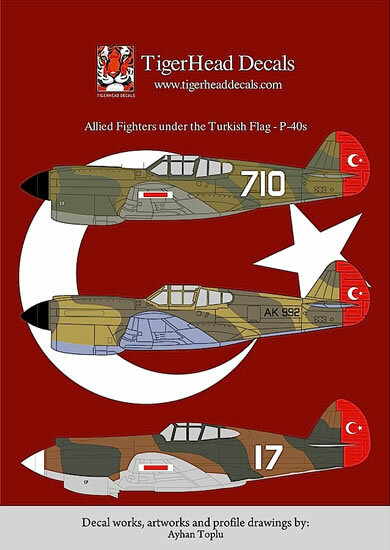 In this context TigerHead Decals is filling a welcome niche, because while decal manufacturers have modern Turkish aircraft reasonably well covered, World War 2 machines have been largely neglected. 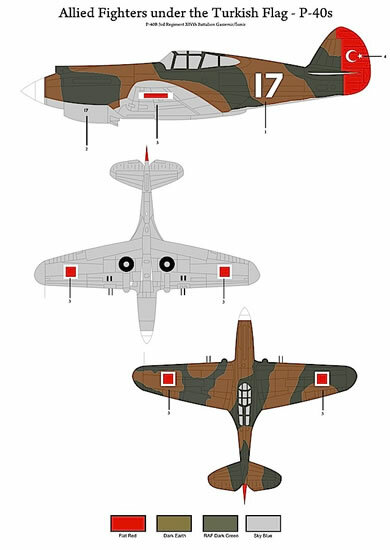 TigerHead has now also released decals for Turkish-operated Hurricanes, and P-47 Thunderbolts in Turkish, Iranian and Yugoslav service. Hopefully there will be more to follow – perhaps coverage of the Spitfires and Fw 190s that served side-by-side in the Turkish Air Force? Thanks to TigerHead Decals for the review samples..